Tópico em 'Brasil e outros países de expressão portuguesa' iniciado por Gerofil 25 Fev 2013 às 21:34. In January 2013, torrential rains pushed the Limpopo River over its banks in southern Mozambique, inundating homes and agricultural fields. As of January 29, 2013, the Associated Press reported, 38 people had been killed and 150,000 had been displaced. Among the areas hardest hit by the floods was the city of Chókwé, situated west of a bend in the Limpopo River. These images compare the flood conditions with relatively normal conditions for the season. Both images are from the Advanced Spaceborne Thermal Emission and Reflection Radiometer (ASTER) on NASA’s Terra satellite. The top image was acquired on January 25, 2013, and the bottom image was acquired on February 11, 2005. ASTER combines infrared, red, and green wavelengths of light, and these images approximate but do not match natural color. Green indicates vegetation. Dark blue indicates water that is largely free of sediment. Sediment-rich water appears in shades of lavender and pink-tan. In February 2005, the Limpopo River was safely confined to its narrow, meandering channel, away from the city and the nearby agricultural fields. Some water might have lingered from a previous flood, however, suggested by the dark blue rectangles in the lower right corner of the image. In January 2013, flood water from the Limpopo overwhelmed Chókwé, extending south and west past the city, filling a river channel in the west, and inundating agricultural fields. Flooding rivers carry heavy loads of sediment. 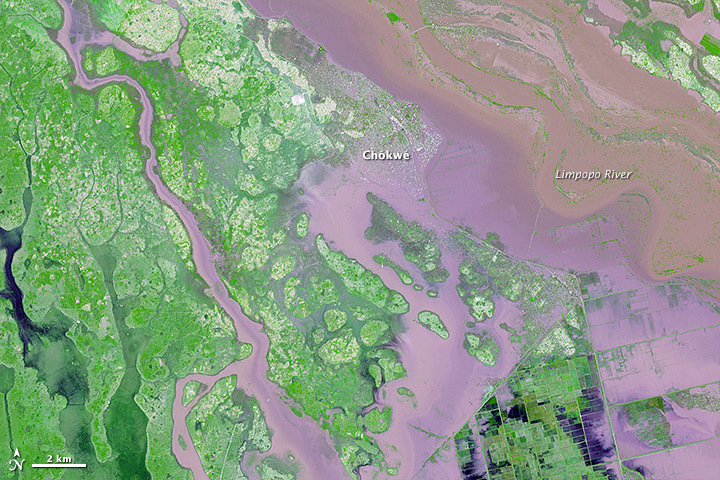 In January 2013, lavender and pink-tan both indicate sediment-rich water, but the water closer to the main river channel likely carries a heavier sediment load than the lavender-colored water farther away. Some water sitting on agricultural fields in the southeast appears sediment-free (dark blue), as does some water in river channels in the west (image lower left and right). According to a United Nations bulletin issued on January 24, residents had started to evacuate the cities of Chókwé and nearby Guija, but many residents who stayed behind were stranded on rooftops awaiting rescue. Water rose rapidly between January 23 and 24, driven partly by saturated soils that could not absorb any more water and partly by an unstable levee that had been damaged by a tropical storm in 2012. 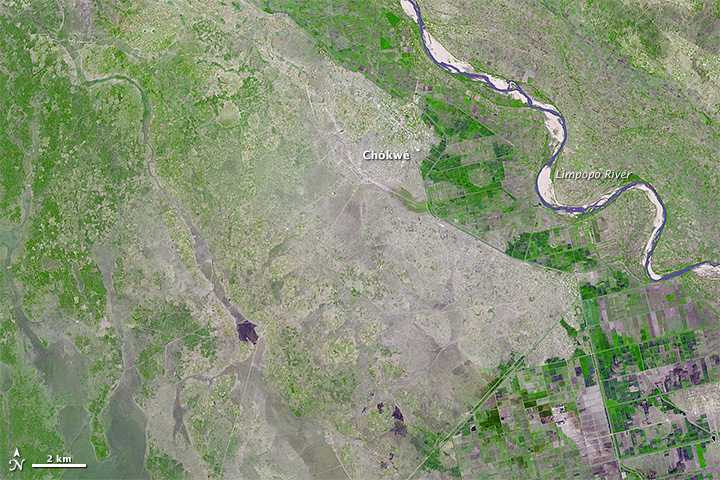 Flood conditions affected other parts of the Mozambique province of Gaza, including the cities of Bilene and Xai-Xai (visible in a wider view of the region). Flooding also affected the countries of Zimbabwe, Botswana, and South Africa.